Anyway. I shall resist getting into my lefty-Cassandra eyeroll du jour re: the perils of free-market capitalism & the current state of the economy, blah blah blah. Instead, let’s talk about food! 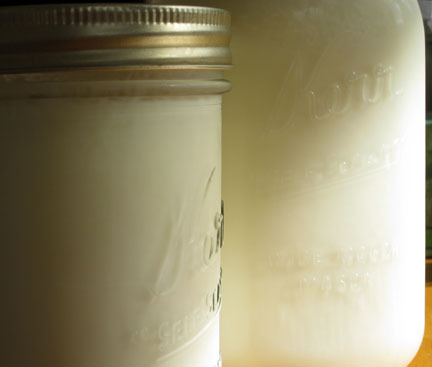 Here we have homemade yogurt, which is both economical & environmental. I went to a yogurt & cheesemaking class at Institute of Urban Homesteading a few months back. When I signed up for the class I only saw the cheesemaking part of it, but as these things often go, the yogurt is the part that has thoroughly infiltrated my daily life. How wonderful to spoon yogurt out of a mason jar! If you’re lucky (geographically as well as economically), you can just roll on down to the store & buy St. Benoît in a quart mason jar for $5-something. But here, let me do the math for you: a half gallon of organic Straus milk is $4-something & you get two lovely quart jars of yogurt out of it. Plus the satisfaction of making it yourself, of course. On the other hand, you might end up eating more yogurt than you knew was possible. I suspect that the plastic angst has actually been keeping a lid on my yogurt consumption for most of my life. Don’t say I didn’t warn you.